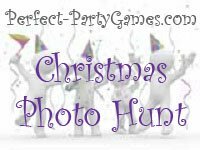 Summary: The Christmas Photo Hunt is where the team members take photos of specific items from a christmas themed list to earn points. Teams typically consist of only 5-7 players, however many will fit in a car. Each team will need a car and driver. Each team needs a camera. Each team needs a copy of the Rules. Each team needs an envelope for each driver. Print a list of the items available to photogrpah with the point value indicated by each item. 3. Each team must take a picture of as many items from the Christmas Photo Hunt list as possible. Scoring: Decide how many points each item is worth. This should be based on the ease of getting the picture. For instance, if the best outdoor nativity scene is several miles away, it should be worth more points because of time and distance. Winner: The team with the most points at the end of the scavenger photo hunt wins. One team member as the fourth wise man or extra shepherd in a nativity scene.